Alex Studnicka and Jan Folwarczny, the winners of STRV’s first Silicon Valley Contest, flew into San Francisco recently for a whirlwind four-day tour of the Bay Area’s bustling startup scene. Their visit included stops at Twitter, Google, Dropbox, Apple, Facebook and Adobe. With a packed schedule, Alex and Jan’s California adventures started shortly after landing at San Francisco International Airport. Grabbing a lift from Uber at the airport curb, the two were immediately whisked to Dropbox’s brand new headquarters, where they were given a private tour. 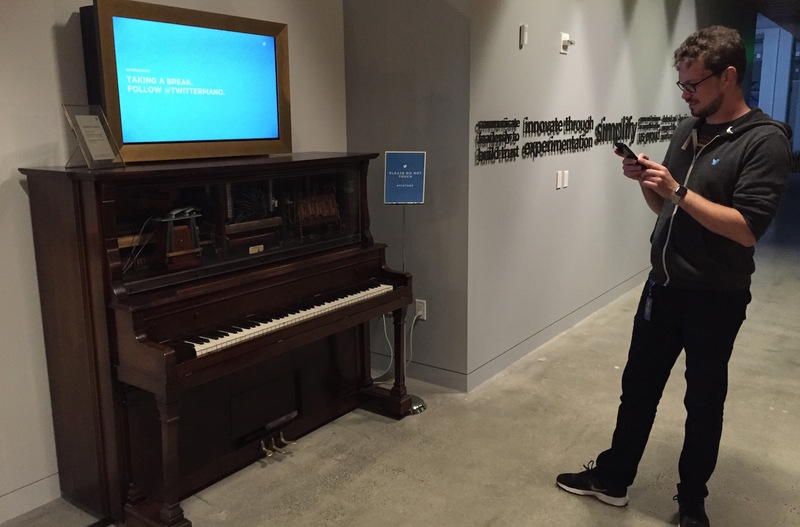 Next up was Twitter, whose offices were full of bright shiny objects — including a most unique piano. Tweet the name of a song, tag the piano’s “username” (yes, it has a name), and guess what? The piano plays the song you’ve requested. Out loud. By itself. No kidding. Alas, the guys only had time for one song before it was time to hit the road again. Alex and Jan participated in a developer meetup at DG717 focused on security automation. They had a chance to mingle with fellow engineers, following a presentation by Ryan Huber from Slack. Our winners arrived at STRV’s coding villa in downtown San Francisco later that evening, where they were greeted by our local team and dined with STRV CEO David Semerad. The following morning included visits to the Zynga and Adobe campuses in San Francisco. By the afternoon, Alex and Jan were on the highway to Silicon Valley. First stop: the prerequisite visit to Steve Job’s Palo Alto house. Photos were of course snapped in front of the garage, the iconic birthplace of the first Macintosh computer. (Amen!) The guys then enjoyed a stroll around Apple’s Cupertino headquarters, even stealing a peek of the tech giant’s new campus which is currently under construction. A trip to Silicon Valley would not be complete without a visit to the Googleplex. Our contest winners were treated to a Google smoothie after touring the massive campus. It was simply a Googleful experience. On the way back to San Francisco, Alex and Jan stop off at Facebook’s Hacker Way headquarters in Menlo Park, hoping for a Zuckerberg sighting. No such luck this time. The duo’s last two days in the City by the Bay were more low-key. They played tourist, taking a ride on the San Francisco cable cars and swinging by the Golden Gate Bridge for more photo ops. It was fast, but fun! Thanks for coming guys!